The lighting issue is taking care of, I really hope that I will be able to make the transition smooth enough for my corals. I have a AquaMedic aCone 3.0 with a ozone 100 connected to it. The system is functioning for over a year but I still have some very annoying problem: randomly the skimmer overflows. I also have a Apex Neptune controller with all the probes so I measure the salinity, ph, ORP and they are all stable. The level of the skimmer is 17.5 cm so it is in the range of they`r recommendation, and it doesn't happen after feeding or in any other particular moment. It can go very well producing nice and lots of skimmate for about a week or 10 days and then out of nowhere it overflows. I know is not precipitation either, because I don`t use balling method, I have a calcium reactor so the Ca and alk inflow is constant. When it overflows, if I rotate a little the air injection nozzle on the venturi pump it can calm down and it can last one hour, one day or 10 days, then it starts the problems again. The pump is cleaned regularly, I also cleaned the entire skimmer and now I don`t know what to do. Usually these problems are associated with cheaper and bad skimmers, but I refuse to think that a 900 euro brand new skimmer from AquaMedic is bad.. For now the problem is quite annoying and I would really appreciate some advice from you, before I go and change this skimmer. Quoting you <Mmm> . I tried contacting them and they told me , quote : " the skimmer is not bad, is sensitive and the problem is in your water "
Well, I don't think I really have a problem in the water because the parameters I monitor are stable in a reasonable amount for a reef aquarium .The skimmer is placed in the mid sump and when it overflows is not a problem because the water just spills back in the sump, but the idea is that if the cup contains skimmate it will spill back in the tank polluting it, and this makes the skimmer pretty useless . I am just mad because I paid 1000$ + for this and is not reliable. Any suggestions as for a brand or option? I have a question for one of you. I just purchased a Turboflotor 1000 and it has been up and running for over 24 hours now. The problem is, I'm getting a lot of clear bubbles that are filling my collection cup. The cup fills in about 30-45 minutes. I have made no modifications to the pump or air intake. The water level is an inch or two below the collection cup. The water intake pump is a Rio 800+. Any tips on what I can do to get this thing skimming? Or could this just be part of the initial break in period? They say to expect it to do this for 4-12 hours. Hi Nate, thanks for the reply. The water level in the sump is about 5.5 inches. I have the Rio turned down quite a bit. I did notice last night that my water return hose to the main display was kinked. After I addressed that issue the skimmer quit filling up quite so fast. I also added a cap to the air intake tube. Not sure what it is called. it came with my old hang on CPR skimmer. It now takes a couple of hours for it to fill up. I have attached some pictures. Also, one of my down flow tubes is not draining as quick as the other. I checked for an instruction but there doesn't appear to be anything there. I did not install the adjustment caps because the directions say that it works better without them. <I'm curious to see what might happen should you add the adjustment caps. Judging by the pictures in the manual it may actually fill the cup faster. Hi Nate. I installed the caps to regulate the flow as per the instructions. The cup did fill faster. I removed the muffler from the air intake and installed an adjustable air regulator valve that I used for drip acclimation. The foam level is about 1/4 of the way up the cone now and has held that level for about 22 hours. I only have a few centimeters of yellowish brown liquid in the bottom of the cup. What is "ideal" level to have this set at? I want to make sure I'm getting as much gunk out of the water as possible. Hopefully I have this dialed in and now it's just a waiting game. Hello, I have a 54g corner reef tank that's been set up for a few years. Medium bio load and I hadn't been running skimmer because my metal halide lamps were heating up the tank too much if I also ran this skimmer, which has the Oceanrunner2500 pump (38w!). So, I started having hair algae problems which I've been battling with a toothbrush for the past six months or so. I recently switched to AquaticLife T5s and the heat problem is pretty much a non-issue so I decided to hook up my Turboflotor1000 again to see if it would help reduce the algae problem. Sump is a 10g glass aquarium, so space is limited. Anyway, for the past two days I've been trying to get this skimmer to produce any kind of dark skimmate but all I've been getting is clear skimmate with the cup filling every six hours or so. I've taken the entire skimmer apart, cleaned it, even drilling out the venturi holes to remove salt creep/calcium buildup. I even drilled out the top opening to the venturi a bit to make the hole a little bigger thinking more air might help. because of the skimmer cup overflowing clear water and I'm still getting clear skimmate filling the cup every six hours or so. 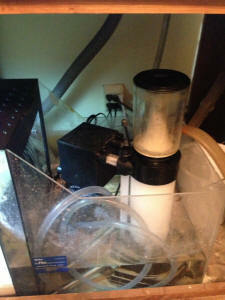 Skimmer is sitting in about 7 inches of water (water line is about 1.5 inches above the top of the OceanRunner pump). I've completely removed the grey flow restrictors (called throttle caps in the owners manual) to reduce the amount of water stays in the skimmer body. very turbulent, with lots of small bubbles forming in the bottom 1/4 of the collection cup neck and larger bubbles above. It seems with the algae problem I'm having there has to be dissolved organics in the water, but this skimmer isn't doing anything useful at this point and I've been doing tons of research on this site and others on how to setup and tune this particular skimmer. Very frustrated and considering buying a new skimmer as this one is 13 years old (a holdover from a 90g setup I had years ago). Bob, I checked my water level in the skimmer body by blocking the air intake with my finger. Both the maxijet1200 and Oceanrunner2500 are running and the water level was a few inches below the top of the clear part of the skimmer body. So, I adjusted the gate valve on the MaxiJet to set the water level so it's about an inch below the top of the black ring where the collection cup attaches to the skimmer body. This seems to be the appropriate water level based on what I've read online and in the owner's manual. However, this creates massive overflow into the skimmer cup (fills in less than a minute) so I put an air valve on the air intake hose and dialed it down until I was getting a nice consistent amount of foam going into the cup. This was at 10pm last night. As of 8am this morning, I have about 1/4" of light brown skim in the collection cup, a nice foam head, and the neck of the cup is coated in light brown slime. So, it appears this is producing some skim but I'd hope for more than this eventually. Seems like I should be able to get a dark, stinky nog instead of this light brown stuff that doesn't have any smell or solid chunks (it's just brown water at this point). Do I need to be more patient or do you think this weak skim output is a sign that my skimmer needs replacement? I figure I should wait at least a few more days with the current setting to see what kind of skimmate I get before deciding on a potential replacement. Again, this unit is 13 years old, so I know it's both obsolete compared to current designs and might also be wearing out. The OR2500 is only about 5 years old as I've replaced it once. The Turboflotor seems to be extremely touchy compared to many other skimmers from what I've read. With all the talk of people doing mesh mods and other things to get their pumps to pull maximum air, it seems counterintuitive that I would need to dial down my air flow to give this skimmer to work. Still confused as to how to tune this thing, but hopeful I'm making progress. At least it's not overflowing the cup every five minutes. I have a question regarding my protein skimmer which is the AquaMedic Turboflotor blue 3000, I'm currently using it in my sump and my display tank is a 200 gal FOWLR for 6 years. Inhabitants are 3 adult fish comprise of a Naso, Blue and Koran (all around 9 inch long), 3 medium size fish comprise of a another blue tang, yellow tang and Lamarck Angel (around 5inch long). Add in the mix is a pair of false Perculas. I feed twice a day and I don't consider myself overfeeding my tank but enough to keep all fish plump. Back to my question, I suspect my skimmer is under performing as I only get about slightly less than 1 cm of wet skim mate every week and my nitrates is around 40ppm constantly. I have tried many ways to tune the skimmer but all comes back to the same result, lowering the pump(increase water level), heighten the pump(both reducing water level or put egg crates under the pump), cut the air intake hose shorter, reduce air intake, various water output valve settings. Now I'm seriously considering changing to another brand, but before I take the plunge I would like to seek your advice on whether there's other ways of fine tuning it that I haven't try yet. Hi, I was skimming through the Turboflotor faqs and came across this issue I was having... the water does not go past half way on my skimmer either. I was wondering if you plug the hole where the overflow water comes in... how does water get inside the pump and into the skimmer? It's me again. I was reading through the skimmer FAQs again and noticed a lot of people were still having trouble with the Turboflotor setup. I just wanted to throw in my 2 centavos worth and show how I setup the skimmer running only one pump. Most people either run 2 pumps OR one pump and water getting fed to the skimmer through an overflow. I thought both of these methods were inconvenient so I ran only one pump, but could never get the water to rise more than 1/2 way up the skimmer column, no matter how much I adjusted the two valves. The solution was simple, just remove the pipe used to connect to the overflow hose and plug up the hole at the bottom of the skimmer column that goes from inside the skimmer to the pipe you just removed. I did that and my skimmer has been working great using only one Rio 2100. Hope this helps. We can hop on the forum if I wasn't clear enough. Hope you have a good day. <Ah, another lesson (for me) in personal "arrogance"... I would have sworn most everyone would have known of this modification... Thank you. Bob Fenner>"
I don't know if partially blocking the exit would make sense here either. body, I can't even get it that close with the pump on. 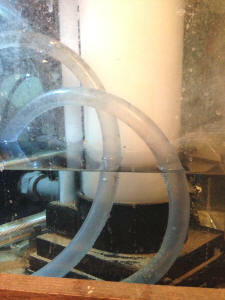 The skimmer is sitting in about 6" of water and the water level inside the skimmer body is about 7". It's been a while since I've written, but that's only because your FAQ's are so detailed that they answer most of the questions I have. I realize you get a lot of similar questions, and think it's only fair that I put in a little bit of effort researching your site before I ask for your help. I thought I would take your advice and upgrade to an Eheim 1260. After reading your FAQ's, I used rigid PVC to connect the pump to the skimmer while also making a venturi on the intake side and adding a ball valve on the output side to moderate the flow. I built the venturi by reducing down to 1/2 inch PVC into a Tee, with the top branch/hole of the Tee extending above the water level where a ball valve helps regulate the air that was pulled in. On the output side, the 3/4 inch pump hole is also reduced down to 1/2 inch PVC where it travels about 2 feet into another sump where the protein skimmer hangs and water is discharged. I thought I would pull from and discharge into different sumps because I always thought it strange that the skimmer discharged right next to the pump that drew water into the unit. Anyway, I was quite proud of myself until I turned the unit on and the water rushed into the skimmer quickly filling up the cup with tank water. I cranked open the venturi ball valve and throttled down the one on the output side, but find that there are either too many bubbles (which quickly overflows the reservoir) or none at all (which causes water to just cycle through the skimmer). It's gotten to the point where I am afraid to leave the skimmer alone when on for fear of it overflowing and even draining my sump. Not sure if I gave you enough information, but before I pull out what little is left of my hair and/or redo things completely, I hope you can help me problem-solve. Only thing I can think of is that I shouldn't have reduced the input (which would allow more air to be drawn into the pump) or that the skimmer is too far from the pump. A least one of your FAQ's mentions placing the venturi on the output side of the pump, but I am not sure how this could work. In this configuration, wouldn't the pump just push water out of this pipe rather than sucking in the necessary air? To clarify, I am able to adjust the volume of air going into the pump using the ball valve that I put on the top of the 1/2 inch PVC leading to the Tee on the input side of the pump. What I have found, though, is that I have to open this ball valve all the way to generate bubbles in the lower portion of the skimmer, which essentially means that I am drawing air through the full diameter of the 1/2 inch PVC pipe. If I understand you correctly, I will try capping the PVC and running an airline tube into a hole in the cap to see if it makes a difference. TF1000 in Rubbermaid sump Hello yet again! I get a semi noisy vibration sound from my TF1000. It's somewhat related to vibrating against the Rubbermaid, but even if I suspend it in the sump, there is considerable vibration noise. Regarding the vibrating between the sump and TF1000, do you have any suggestions? A sponge would work, but I don't want anything that would start working as a bio-filter. 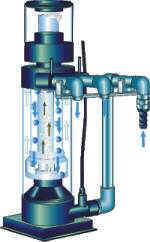 <Yes... to replace the supplied TAAM/RIO pump with an Eheim...> Also, do you suggest getting as much water in the TF1000 from the overflow as possible and adjusting the exhaust outputs to optimize "bubble" concentration, or leaving the exhaust outputs fully open and regulating the amount of water into the main chamber? - Eugene <A mix of the two is actually best... Bob Fenner> Thanks in advance.